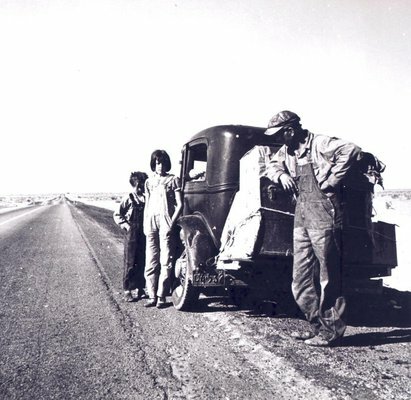 A family lingers on the side of the highway near their car and meager belongings on the great trip west during the 1930s Dust Bowl. As the popularity of genealogy and family history sites rises across the nation, numerous families from California and the West Coast are discovering their Oklahoma roots, many of which lead back to the migration stemming from the Dust Bowl era of the 1930s. Any population shift, like the one seen during the Dust Bowl, is extremely relevant to genealogy research. If your ancestral searches have hit a dead end during the 1930s, particularly if you reside along the West Coast of the United States, Oklahoma may provide the key to unlocking your family's history. Understanding the events of the time period will help provide a solid foundation for your search, so whether you’re trying to flesh out your family tree or wanting to walk in the footsteps of your Dust Bowl ancestors, read on to discover a slice of Oklahoma’s legendary past. The Dust Bowl days conjure up images of dark dust clouds descending upon farmhouses, harsh economic conditions, migrations westward and inevitable references to the state of Oklahoma. While Oklahoma contained less acreage designated by the Soil Conservation Service as being part of the Dust Bowl than Kansas, Colorado or Texas, the prevailing image of Oklahoma has been intertwined with the Dust Bowl for decades. Visions of families with Oklahoma license plates making the long journey to California have long been solidified in popular culture through music, literature and even Hollywood films. During the 1930s, overutilization of the soil combined with severe regional drought caused the stripping of the topsoil and resulted in huge storms of dust and dirt across the American plains. Crops began to fail and farm families struggled to make ends meet as they were faced with the reality of eroded farmland and property damage caused by the dust and debris. As families lost hope and packed up their belongings in search of better opportunities, the westward migration began. The Dust Bowl migration began in earnest in 1935 and peaked between 1937 and 1938. Oklahoma families, as well as travelers from neighboring states, journeyed along lonely stretches of desert road, as they trekked to California and the western states. John Steinbeck’s classic 1939 novel, The Grapes of Wrath, cemented the plight of these Oklahomans in Dust Bowl lore. His fictional account of the Joads, an Oklahoma farm family, chronicles their struggles as they travel along Route 66 to California after their farm turned to dust. The Dust Bowl lasted about a decade before the rains reappeared across the Great Plains. Once farming opportunities improved, many Okies returned home after facing discrimination and even greater hardships in California. However, many also settled permanently in California and along the western coastline. It is the descendents of these Okies turned Californians that have the most to gain from genealogical research in Oklahoma. We’ve taken the guesswork out of the process by providing some of the top resources for uncovering your Dust Bowl era ancestors and learning more about their experiences. So let your family’s history fall into place as you gain a better understanding with a visit to the experts and resources at these locations. This research center located within the Oklahoma History Center in the heart of Oklahoma City is the best place to begin Dust Bowl era genealogical research. Armed with a multitude of online computer stations, a plethora of Dust Bowl era oral histories and video clips, and knowledgeable research staff willing to help in your search, the OHS Research Center is a virtual gold mine of statewide information. The staff can help you track down your Oklahoma ancestors and then enrich your experience by pointing you to photos, newspaper articles and WPA information to help you gain a full appreciation for the conditions they lived through. Guymon, the seat of Texas County in the panhandle, was the epicenter of Dust Bowl affected areas in Oklahoma. Visit the Guymon Public Library’s Genealogy Room for dedicated resources detailing Guymon’s past and heritage. Flip through years of census papers, helpful collections and documents pertaining to local history and the people who lived there. This genealogy-rich collection is supported by dedicated staff willing to help find answers to your genealogy questions. Make a trip to No Man's Land Museum in Goodwell in northwest Oklahoma’s panhandle for a wealth of Dust Bowl information and artifacts. The museum’s exhibit, “The Dust Bowl in the Oklahoma Panhandle,” features photographs from the Oklahoma Historical Society, as well as a video of Dust Bowl survivors and experts. Stick around to go through a large archive of area newspapers, photographs, documents and a small library on regional history as you seek out more information on your ancestors. Walk in the well-trodden footsteps of your Dust Bowl ancestors with an engaging trip across Oklahoma. Let your imagination whisk you and your family back to the Dust Bowl days of the 1930s with a trip down highways and byways, heading west across Oklahoma. Start your journey in the eastern Oklahoma town of Sallisaw just like Steinbeck’s novel, The Grapes of Wrath, and head west across the state. Travel Route 66 through the western half of Oklahoma through uniquely American small towns and past old motor courts and gas stations, such as Lucille’s Service Station in Hydro. No Dust Bowl road trip would be complete without a photo-op outside of the Beckham County Courthouse in Sayre, famously featured in the 1940 movie adaptation of The Grapes of Wrath. Learn the history of Route 66 while traveling with a stop at the renowned Oklahoma Route 66 Museum in Clinton. Visitors will enjoy literally walking through six decades of Route 66 history. Each perfectly staged room depicts a different decade with music from the time period, vehicles, a variety of artifacts and videos. Further west, the National Route 66 & Transportation Museum in Elk City also documents the legend of the Mother Road with recorded histories and personal accounts from overhead audio kiosks. Also, check out our Route 66 Attractions Map for more pit stop ideas as you trace your way along the Dust Bowl migration route. For other locations where you can learn more about the Dust Bowl, check out the Museum of the Great Plains in Lawton which exhibits photographs of Oklahoma citizens caught in the great dust storms, and the Jones & Plummer Trail Museum in Beaver that also features Dust Bowl photographs of the area most affected by drought. As Oklahoma and the rest of the nation step forward into a new century, an interesting trend has emerged. More and more, Californians and West Coast citizens are moving east, essentially reversing the trend of the Dust Bowl migration west. Many Californians participating in this mini-exodus are returning to the areas of Oklahoma that their families left decades ago, lured by the values of the heartland, Oklahoma’s friendly people and family ties. Whereas families left Oklahoma during the Dust Bowl drought, they are now returning to find a state in resurgence and a renaissance of exponential growth. A state once known for the Dust Bowl, Oklahoma is increasingly known for economic opportunity in the new millennium, attracting families and businesses nationwide to the Sooner State. Whether searching for Dust Bowl relatives or simply traveling to Oklahoma’s wide variety of tourist hot spots, visitors will enjoy Oklahoma’s vast urban renewal in both Oklahoma City and Tulsa. Oklahoma City is proud to boast a vibrant downtown area, the nearby bustling Bricktown Entertainment District, the NBA Thunder professional basketball team and the world-class Boathouse District that attracts Olympic hopefuls in rowing, canoeing and kayaking. Visit the popular lakes of the state and experience more miles of coastline than the Gulf and Atlantic coasts combined while kissing the image of a dusty and dry Oklahoma goodbye. Step into the fascinating history surrounding the Dust Bowl and connect with your Oklahoma ancestors that survived the era to thrive and wear the term “Okie” as a badge of honor. Now armed with the tools to research your family’s Dust Bowl ties and the relevant history of the time period, it’s time to allow the locked doors of your family’s past to swing open with a trip to Oklahoma.